Maternal addiction is a significant factor behind the endogenous and the exogenous problems in children. This study extends the works of Cicchetti and Rizley (1981) by providing developmental parameters to classify, categorize and identify common and salient problems of children of addicted mothers (COAM). An archival method was used to review files (36 files, 69 participants, male=39 and female=30) from a residential drug rehabilitation facility. Files were reviewed in terms of children’s health and psychological problems and the purpose of the study was to discover how maternal addiction negatively influences children in relation to specific drugs; and to determine the severity and the nature of those problems in terms of how maternal addiction translates to particular problems in children. Results showed that common endogenous problems ranged from biological to psychological problems, with cognitive deficits and emotional wellbeing being salient problems. In terms of exogenous problems, unstable home environments, neglect and abuse were salient. 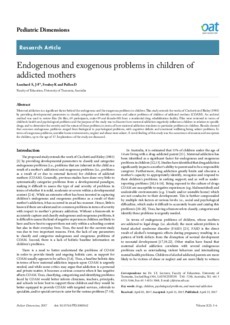 A novel finding of this study was the occurrence of enuresis and encopresis for children, up to the age of 17. Implications of the study are discussed.